Surprisingly, my most popular (or most visited) post of 2012 was this traditional hummus recipe. I don’t know why but if you search for Hummus or Hummus recipe in Google it’s right up there on the first page. Consequently I get loads of traffic from search engines. I should really learn how this all works. Maybe that should be my New Year’s resolution. The trouble is I’m too busy doing what I enjoy doing, which is cooking, to want to spend more time on the computer. So it’s probably not going to happen, but you never know. If someone had told me at the start of 2012 that by the end of the year I would be teaching Vegetarian Cookery Workshops at a cookery school in Spanish I would laughed in their face. Speaking of which, this beautifully sweet, deliciously deep magenta coloured dip, is one of the dishes from the Middle Eastern inspired Christmas party menu workshop that I hosted in December. It formed part of a festive jewel coloured mezze that we all devoured with a glass of pink cava after everything was prepared. I will be sharing more of those recipes with you over the next few weeks. I bought some little organic baby beets from the market which roasted in about 30-35 minutes but if you can only get larger ones, cut them in half or quarters and roast until they are tender all the way through. This could take up to an hour depending on their size. Use gloves when you rub the skins off, if you don’t want fuchsia fingers. Trim off the leaves, leaving about 2 inches of stalk attached and leave the root on. Cut into halves or quarters if large. Preheat the oven to 200 C and line a baking tray with baking paper. Lay the beets on the tray, drizzle with olive oil, season with salt & black pepper and some fresh or dried thyme leaves. Roast until tender all the way through. 30 mins to an hour depending on size. Leave to cool then cut off the stalks and roots and rub the skins off with kitchen paper. Roughly chop the beetroot and put half of it along with half of the chickpeas in a food processor and blend until finely chopped, scraping down the sides as necessary. Add the rest of the beetroot (saving some finely chopped for garnish) and the rest of the chickpeas and blend again to a paste, scraping down the sides. Add the olive oil, tahini, lemon juice, cumin, salt & black pepper and blend to a smooth paste. Taste and adjust seasoning as required. 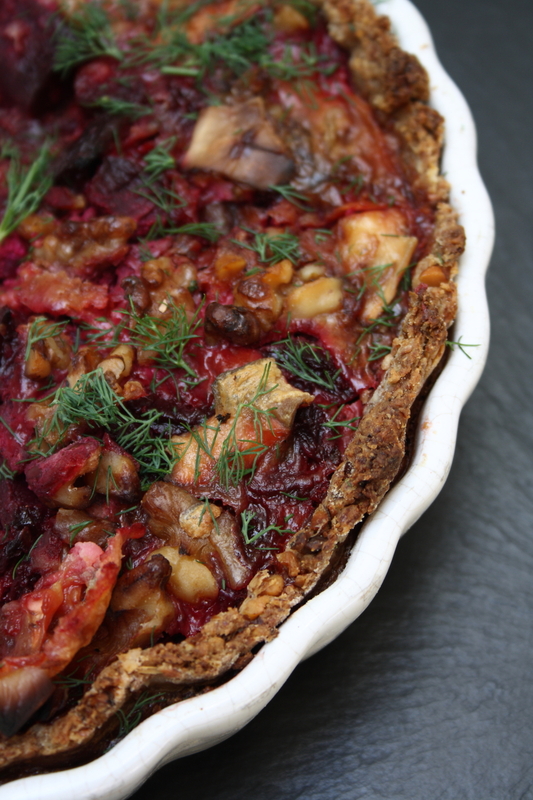 Serve topped with some finely chopped beetroot, sesame seeds, a drizzle of olive oil and a sprig of fresh dill, if using. Preheat the oven to 125 C. Brush your lavash or tortillas with olive oil, sprinkle over some cumin, sumac (if using), salt & black pepper. Using scissors, cut the lavash/tortillas into triangles and place on the baking tray(s). Cook for 10-15 mins until slightly golden and crispy, keep an eye on them. Leave to cool slightly (they will crisp up a bit more) and serve immediately with the hummus. These crackers are also great served with Baba Ghanoush, Muhammara or even Guacamole. I know it may be a little early in the season for watermelon where you are, or it may even be getting on for winter but I got a baby watermelon in my organic veg box this week. Look how cute it is. Look, I put it next to a lemon for you so you can see how small it is. Watermelon is one of the ingredients in my favourite summer salad and it is definitely feeling a lot like summer here so this is what I made with it. Put the finely sliced red onions in a small bowl and cover with the lemon juice. Leave to soak while you make the rest of the salad. This makes the flavour less harsh and turns them a pretty magenta colour. Place the watermelon triangles in a beautifully random arrangement on your serving dish/plates. Cut or break the feta into similar sized pieces as the watermelon and scatter them amongst the watermelon. Tear off sprigs/leaves of parsley and do the same. Tip the bright pink onions and their juices over the salad, add the olives, drizzle with a little olive oil and top with the chopped pistachios and a grinding of black pepper. Serve with extra wedges of lemon if you like. This is me sending some much needed sunshine in the form of this beautiful salad to all the people in the UK celebrating the Queen’s Jubilee in the cold and rain. This is my 93-year-old Grandad at a Jubilee garden party yesterday. He is wearing ski gloves, a shawl and a blanket over his legs. This is the 4th of June by the way, a typically English summer’s day!! Sending you some sunshine Grandad, Enjoy!! Following on from yesterday’s post about inspiration and where I get my ideas from, this recipe illustrates perfectly the combination of factors that come together to create something nice to eat. Because that is what we are talking about here. Food that you (and I) want to eat. And you want to eat these, I can tell. You’re dribbling. Strawberries are at the peak of their season here at the moment, so they are cheap and bursting with flavour. Well these ones are anyway, so they need to star in a recipe. Every morning for the past month or so I have been running with the dog surrounded by the intoxicating scent of orange blossom. I know, I’m lucky. It is such a beautiful smell that hits you as soon as you walk out of the front door. Well I do live in Andalucia. Anyway the past couple of days it has been noticeable in its absence. We are coming to the end of the orange blossom season and I realised that I haven’t used its aromatic orange blossom water in a recipe this year. On our last day in Cape Town we went for Sunday lunch at the 15 on Orange Hotel. Every Sunday they have a buffet lunch for 265 Rand that includes endless bubbly. Yes, endless bubbly. Are you mad? Have you met my Dad? And me come to that if you’re talking about bubbly. It’s not cheap stuff either, we really enjoyed quite a few glasses of the Graham Beck Brut Rose. The hotel is elegant, modern, luxury designer chic . An enormous Murano glass chandelier with a staircase inside leading to a private lounge dominates the luxurious bar area. The lighting is actually really impressive throughout the hotel. Now when you talk about buffets in hotels what springs to my mind is elbowing your way around a table filled with wilting salad, crusty under the lights sandwiches, dried up slices of meat hidden by a slimy gravy and suspect piles of defrosted prawns. Not my thing, at all. This couldn’t be more different. The restaurant is bright, modern and in no way does it smell of boiled meat. The standard of the food is unbelievable. It’s the best looking buffet I’ve ever seen. Beautiful feta salads, mozzarella & tomato Caprese with basil pesto, roasted vegetable terrine, beetroot tian, a cheese selection with chutneys. That’s just the veggie starters by the way. For main course I had an excellent Eggplant Parmigiana but it was the desserts that impressed me the most. The selection was mind-blowing. Chocolate cherry tortes, blueberries & cream violet syrup shots, cape gooseberry madeleines. A cake stand full of chewy meringues, chocolate or caramel & cinnamon, white chocolate sacher torte, and enormous pink marshmallows. The keep bringing out new things too. It’s amazing. It is seriously worth coming here just for the desserts and bubbly. You want to try them all because they look so good. They are all quite dainty so you don’t feel like such a pig for eating more than one. I had the cinnamon caramel meringue, the chocolate cherry torte and one of these strawberry custard slices. So when I got home and strawberries came into season here, I started badgering them for the recipe. And here it is. The only thing did differently was add some orange blossom water to my custard. I cut my puff pastry into fairly small rectangles 3 x 9 cm so they are quite ladylike and afternoon tea-ish. You can make yours bigger if you like. Remember to defrost the puff pastry in the fridge overnight before you need it. Preheat the oven to 190 C and line a baking sheet with baking paper. On a floured board, roll out the pastry to a large rectangle about 2 mm thick and trim the edges so they are straight. My rectangle was 27 x 36 cm so I cut it into 36 mini rectangles 3 x 9 cm. (9 columns 4 rows). But you can cut them whatever size you like. Put them on the lined baking sheet, dock them well with a fork (this stops them rising too much) and put them in the freezer for 5 minutes. Bake for 10 to 15 minutes until puffed, golden and cooked all the way through. Some will rise a bit wonky or too much but you can ignore those there’s still loads left. Leave to cool on a wire rack. Meanwhile make the creme patissiere. Carefully bring the milk to the boil with the vanilla extract and orange blossom water, then turn it off before it boils properly. Meanwhile whisk the yolks with the sieved cornflour and sugar to a smooth paste. Add a splash of the hot milk to the egg mixture and whisk to loosen. Add this back into the pan on a medium high heat and whisk continuously until it starts to thicken. Remove from the heat when it is thick and taste it. If it still tastes of flour or needs loosening up add a splash of milk, return to heat and whisk it in. When it is ready cover the top of the custard directly with cling film to stop a skin forming. Hull the strawberries by pulling out the green stalks and removing the stalk area with a small knife. Thinly slice them from top to bottom. To assemble: pipe or spoon a small amount of creme patissiere along the pastry rectangles from front to back. Then top with three (or more if bigger rectangles) slices of strawberry, start at the back and position the pointy end up. To glaze: heat the jam/jelly in a small pan with the water until it is a liquid. Brush the glaze over the positioned strawberries. You will now realise that you have quite a few custard slices. Obviously you will have to eat a few just to see how they taste but beware, they are addictive. My suggestion is to do what I did and donate them to friends (thanks Rhian & Jeanne) because they will love them and so will their husbands. And you won’t end up the size of a house and blame it all on me. Hopefully. For more information about 15 on Orange Hotel and their menus visit their website here. This is like a spicy pickled red cabbage that is served hot. The cabbage isn’t overcooked so it keeps its crunchy texture and beautiful deep magenta colour. It is lovely served as a side dish with any curry but specifically, in my opinion, with a dhal. I roasted off another batch of my favourite slow roasted tomatoes yesterday and wanted to use them in something lovely for dinner. I found a recipe for a grilled vegetable saffron risotto cake that fit the bill perfectly. In the original version they layer it with grilled aubergine, courgette and roasted peppers which I will definitely try next time. But I had all these sweet roasted tomatoes hanging about and I was hungry, so I just used them. I also added some of my sundried tomatoes for extra tomato intensity. Put the veg stock in small pan, over a medium-low heat to heat up while you are cooking. Heat the oil in a large pan over a medium heat and cook the onion and saffron with a pinch of salt for 5 -6 minutes until softened. Then add the fennel seeds, garlic and chilli flakes and cook for a further 2 minutes. Now add 12 of the roasted tomato halves and any roasting juices, the chopped sun-dried tomatoes and the rice. Cook at a fast simmer, stirring for about 2 minutes, season generously with salt & pepper & splash in the wine. Add the hot stock to the rice a ladleful at a time over a medium heat, adding the next ladleful when the previous one has all been absorbed. Continue like this until most of the stock is used up (1 litre for risotto rice – 1 1/2 for brown rice), taste the rice and see if it is cooked. It should still have a bit of bite to it. Season again, add in the finely shredded basil, stir and taste. Remove from the heat and leave to cool. I didn’t leave it to cool very long, I was hungry. Preheat the oven to 180 C. Line the base of a terrine or loaf tin with baking parchment and oil/butter the sides. Take 1/3 of the cooled rice and press it into the bottom of the mould evenly. Top with 4 of the remaining roasted tomatoes in a line along the centre of the rice then top those with a half of the mozzarella slices, the a line of sun-dried tomato strips, then with a line of basil leaves. Sprinkle over half the grated cheese. Top with another 1/3 rice, press down evenly and add toppings as before. Then finish off with the final layer of rice and press down evenly. Cook in the preheated oven for 30 minutes until golden brown on top. To serve, run a knife around the edge of the cake and turn it out onto a serving plate. Use a serrated bread knife to cut into generous slices and serve with a rocket salad dressed with olive oil, balsamic vinegar, salt and black pepper. This is equally good served hot or cold and would be perfect for a summer picnic or buffet table. I’m having this cold for my lunch now, have a great weekend!